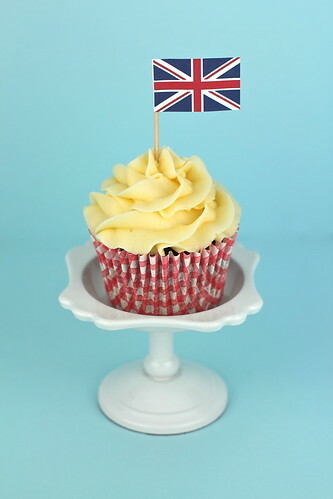 With Royal Wedding fever now in full swing, and only 4 days left until the big day I thought I'd share a few cupcakes decorating ideas I put together. 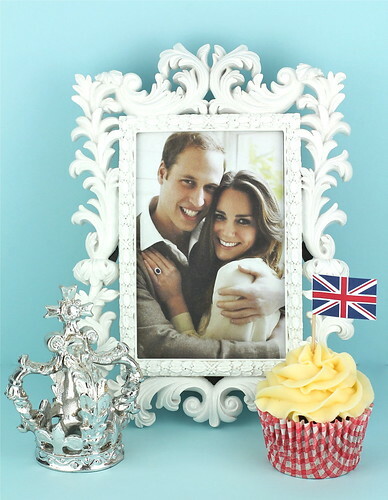 In the UK we've been lucky enough to be given the day off as a national holiday (thanks Will & Kate! ), so there will be thousands of viewing parties and the occasional street party going on so we can all help share in the celebrations. But - those parties just don't apply to the people living in the UK. That's right, all across the world friends will be getting together to watch the Royal Wedding and share in the festivities. And what better way to celebrate than with cupcakes! For simplicities sake I decided to use Martha Stewart's One Bowl Chocolate Cupcakes, but really - is there any other way to celebrate than with chocolate cake??? 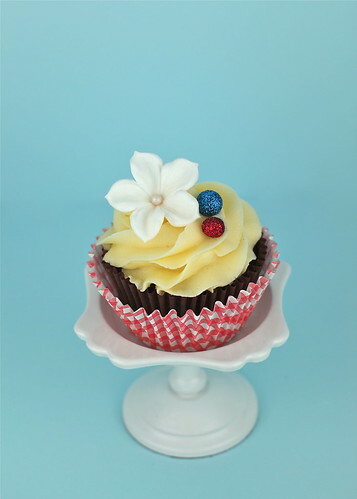 These cupcakes are super easy to bake, and since they only use one bowl you can use the extra bit of time to spend decorating rather than washing up. 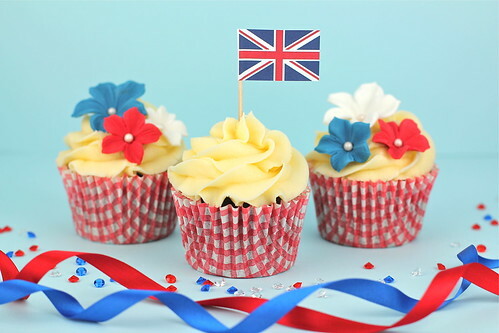 The best thing about these cupcakes (aside from the fact they taste amazing) is that you can make all of the decorations yourself - even the little flags! 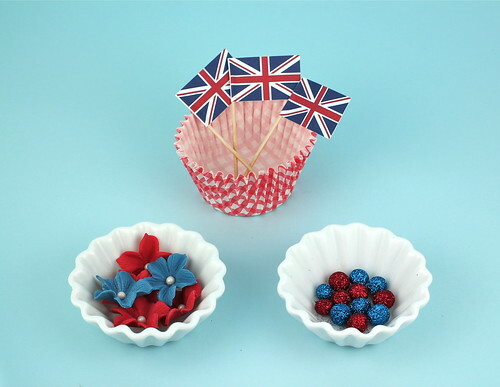 Martha's One Bowl Cupcake recipe, and the printable template for the flags, as well as the full instructions for the flowers and glittery balls can be found here at Made With Pink. 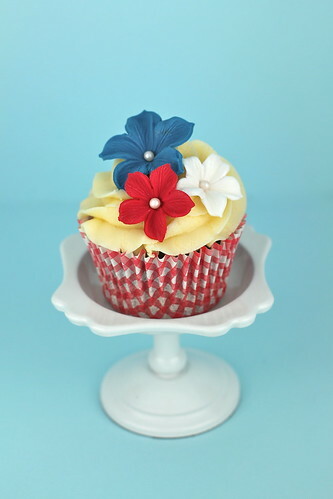 These flowers look a lot harder than they actually are - in fact they're super easy, but you will need a special silicone mold and flower cutters to make them. The mold is called the 5 petal blossom veiner, so I'd suggest having a look around your local sugar craft supply store or eBay to see if they have it. The full instrucitons for these flowers can be found here. Another one of my favourite decorations are glittery balls. These are so easy! Simply roll a tiny bit of sugarpaste into a ball using your hands. Next, brush each ball with a bit of edible glue (not pictured, but available at sugar craft stores & Hobby Craft in the UK). Once the balls are coated in edible glue, simply drop them into a jar of edible glitter and roll them around until they're entirely coated in glitter. Use tweezers to carefully pick up the glitter covered ball, tapping off any excess glitter so it falls back into the jar, and then place them on your cupcakes. I understand that not everyone has time to order the flower mold before the Royal Wedding, or even the desire to spend the time making those little flowers. So, if you're one of those people, then these Union Jack flags are for you! They're seriously easy to make. I've done the hardest part for you be creating the flag template, which can download here for you to print yourself. 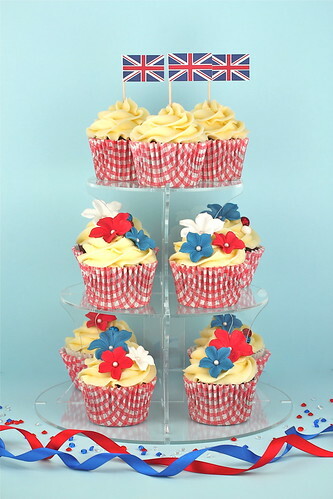 After you've printed off the cupcake flags, simply cut them out along the faint dotted line, use a glue stick to cover the plain back side with glue and then place a toothpick in the middle of the paper & fold the paper over to form the flag. See! Told you they were simple! Now all that's left to do is sit back and enjoy the Royal Wedding!